Several months ago, Cara and Lisa approached me about writing a post for The Helpmates regarding how the church could assist widows. In 1992, my husband passed away from cardiomyopathy after an eight month illness. I was 34 and my kids were 4 and 6. 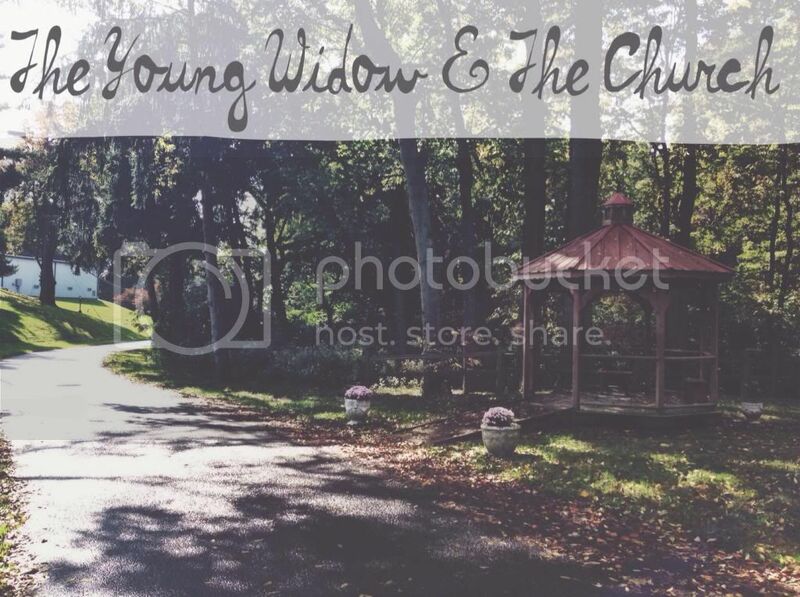 I have been a widow now over twice as long as I was a wife so perhaps the word ‘young’ in the title no longer applies. I would like to share with you 3 simple ways to reach out to a widow. Whenever a woman loses her husband, she becomes a member of a sorority no one ever wants to join. No matter if she has only been married a few years or has just celebrated their 50th wedding anniversary, whether she has small children at home or lots and lots of great-grands scattered across the country, no woman wants to have to face the death of her husband. Still many of us do become widows. I am not going to get into the afflicting part. Widows are under God’s holy protection, if you mess with them so much that they cry out to God about you, it is then between you and God. Don’t do it! James speaks about ‘in their distress’. What does he mean by that? While widows in today’s society are no where near as destitute as widows were in James’ time, they still have a lot of stress and worry causing distress. Funeral expenses, medical bills, losing your husband’s income, etc. can all be devastating financially. The lifestyle you dreamed of or have become accustomed to is often no longer even a remote possibility. You are facing a thousand questions and tons of paperwork all at a time when you are at your lowest point. You are no longer part of a couple. You no longer fit in with many of your married friends. Often before you had your husband’s help with much of the workload, now everything is dumped in your lap. And quite frankly, the ‘stuff’ your husband always handled is stuff you are often unsure how to do or things you absolutely hate to do… sometimes both. You are worried sick about your kids. Whether they are little or grown, they have lost their dad and your heart grieves for them. Holidays and milestones are very, very hard. There is an empty place and your life is no longer the same. Emotionally, you are a mess! I ran the gamut between wanting to throw the covers over my head and stay there forever to constant activity. My best friend told me recently that I did not slow down for at least three years. I think she was right. I guess I thought if I slowed down any at all, I would simply fall apart. Everyone tells you that the first year is the hardest. This may be true, but I remember being so mad when a year had gone by and things weren’t any better. There is no timetable on grief, and it can rear it’s ugly head again and again, sometimes when you least expect it. You may not know much about her situation or what her needs are. You may not even know exactly who she is. It doesn’t matter… God knows her! And when you pray for her, God allows you to be a part of his protection and blessing upon her. Whenever she crosses your mind, pray for her. It doesn’t have to be a fancy, elaborate prayer. Just pray! The Holy Spirit may have brought her to your mind because she needs you to pray for her right then. I can’t tell you how many times in my life I have been held up by prayer, often I am sure by people I don’t even know. Also… as you pray for her, God will speak to your heart about how to pray for her and may even show you ways you can assist her. Smile at her. Make eye contact. Simply say: “Good to see you!” Learn her name. It is so very hard to go anywhere or do anything alone, especially after you have been married a while. Sit next to her and strike up a conversation. Invite her over for a meal or to go get a cup of coffee. Church should be the one safe place she can always feel cherished and protected; a part of the family. When I was first widowed, I seemed to vary between “Oh, no! Everyone is looking at me funny because I am a widow” to “They don’t notice or care about me at all”. Let her know by your actions and words that you care about her and you are glad she is there. Not sure how or when? Don’t worry, God will direct you! It may be financially, it may be through your small group class, through a meal, a household repair, listening, car maintenance, holding a door open, babysitting, making a card. Each widow has her own specific needs and when she knows you are sincere in your offer to help, she will let you know how you can. These things may not seem like very much. Trust me, they can make a huge difference in a widow’s life. In my next post, I will share 3 things not to do. Cara's Mom. Christian. Optimist. Encourager. Cheese Enthusiast. Kathy-great information-loved reading your story- you nailed it- ready for part 2! Amen to all of this! I can’t wait to read the rest of this series. Thank you so much, Susan! You have traveled the same journey yourself so it means so much to me that you think this will be helpful to others. Please feel free to add anything I forgot to mention.